Of all the World Series games I could have attended, I went to this one. We stood two decks up behind home plate, right in front of the press box. Could not have asked for a better view. 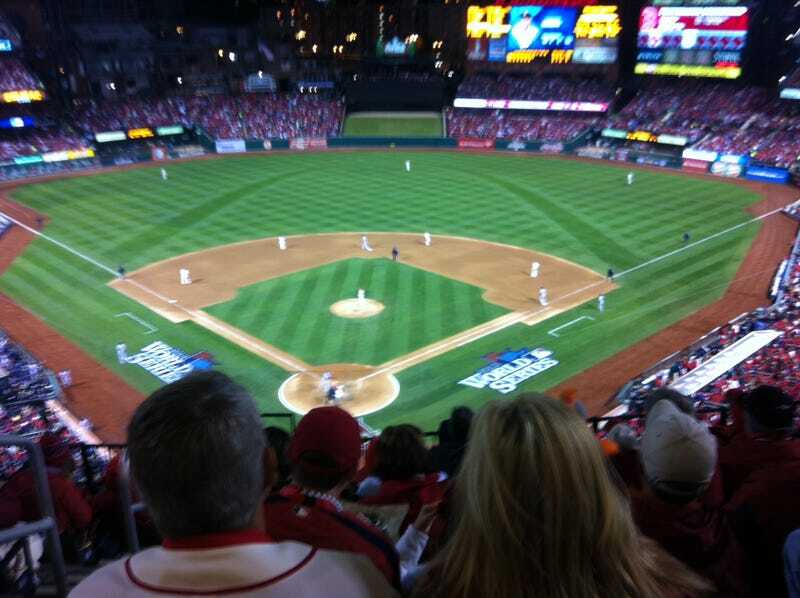 We saw it all: Holliday's double, Bogaert's triple, and yes - the single weirdest call to ever end a World Series game. The atmosphere was beyond electric. I've always loved going to baseball games, but there's a sense of routine about them. The players are playing at least 162 of the damn things, and, as fans, we somehow sense their calm nonchalance. It could be a great game, it could be a lousy one, but regardless it's just another day at work for the players below. Nothing prepared me for this. When people asked me how the game was, all I can say is "I was there." Sox fans commiserate and Cards fans taunt, but unless you were there you can't know. For seven hours, we felt like the luckiest guys on earth. We were witnesses not to a game, but to a revelation. I was there, and I may never be there again. But even that thought somehow makes it more important and more joyous. I'm not one to believe in the supernatural, but being crammed into a box full of 50,000 people whose complete emotional and rational attention is devoted to one swing, one catch, one throw, can make you believe in the power of telepathy. You could feel the crowd as it swung from elation, disbelief, and ultimately a tarnished sort of triumph. You couldn't stand aloof, couldn't pretend that this was just another silly game. You couldn't help, as much as I hated it, feeling the rush of euphoria as fifty legions of Cardinals fans realized that they had just won the game in the bottom of the ninth. I gave Spencer (SUP SPENCER), my best friend from law school and a huge Cardinals fan, a giant bear hug as the fans screamed in pure joy. "Someone had to be 2-1," I said as we wandered, dazed and stupefied, from Busch. "I just can't believe we have to go through this again tomorrow."